In October 2012 I started p2p lending at Bondora. Since the start I did deposit 14,000 Euro. Since then I periodically wrote on my experiences – you can read my last review published in August here. In the 4 months since then, many changes happened at Bondora: New portfolio manager, new dashboard view, new collection procedures, a first version of an API in production, no more transaction fees for buying and selling on the secondary market and Bondora now allows investors to sell and buy defaulted loan parts (60+days overdue). I used this change to sell my overdue Slovakian loans at 87% discount. I also sold my remaining Spanish loan parts. I did not have much of either of these in my portfolio anyway. 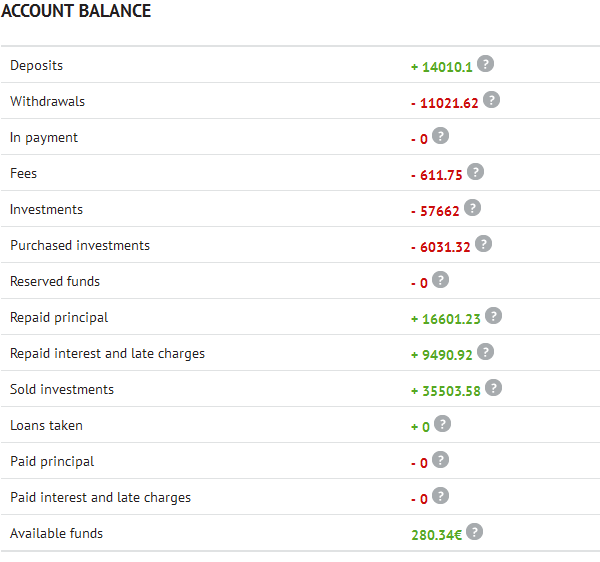 I also reduced my overall portfolio position at Bondora and transferred 11,022 Euro back to my bank account. I managed to sell many of my Estonian loans at a premium. My perception is that the liquidity on the secondary market increased after the transaction fees were removed. Still it is hard to effectively navigate on the secondary market. I find it hard to price 60+days overdue loans I want to sell on the secondary market. The site Bondpicking.com has charts with recent transactions for defaulted loan sales on the secondary market that can help as guidance. Currently I still have loan parts with the value of 11,428 Euro outstanding principal. Of these 1,441 Euro are in loans that are overdue and 2,076 Euro are in loans that are 60+ days overdue. At the moment I have 280 Euro cash available. I am very satisfied with my Bondora investment. Of the 14,000 Euro investment I already withdrew over 11,000 Euro, meaning my remaining risk (concerning the initial investment) is very limited and I still have a huge portfolio of loans. 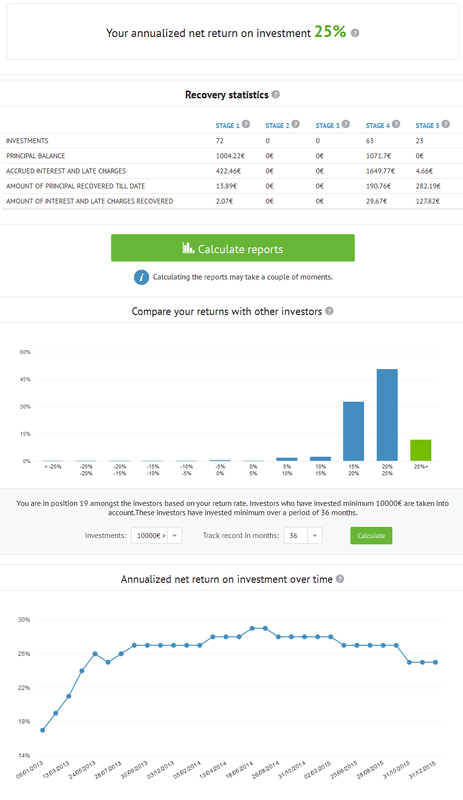 Currently Bondora shows my ROI to be 25.0%. In my own calculations, using XIRR in Excel, assuming that 30% of my 60+days overdue and 15% of my overdue loans will not be recovered, my ROI calculations result in 16.3%. Even in a very pessimistic scenario adding up only withdrawals (approx 11,000 Euro), current loans (about 8,200 Euro) and cash (280 Euro), the initial 14.000 Euro grew in three years to a value of 19,500 Euro. If you are satisfied with the results what is the reason of taking money out from Bondora? 16% XIRR is a nice yield IMHO. It’s nice to see that among all the chaos and misinformation people are sharing actual good experiences in terms of returns as well, I was starting to feel like a lone weirdo at times! Thanks Claus for sharing your experience with bondora. Thanks for the follow up! Could you (or anyone) please provide the direct link to the Account Balance? The link has been removed from the interface. I have observed a very strange thing with Bondora. On the Cashflow tab, the amount show is much inferior to the amount calculated if I do the sum of all actual payment when I look at the details for a given day. How to explain that difference? I did not look at the cashflow recently. To my knowledge the cashflow display is way off reality (at least for planned payments) as it incorporates planned payments for loans that have defaulted. I started investing with Bondora early this year. i was shocked about the extremly high default rate although I did only invest in Lithuatian loans and had a high percentage of AA and A rated loans. Therefore I sold all my loans. That was when I realised that the secondary market was not as liquid as expected and it took my a while even to sell my best rated loans that where paying always at time. Then I had trouble with the indentification process and wrote a letter to Bondora with my bancing details, a copy of my identity and the order to transfer the money to my account and to delete my account. I never got an answer and there was no reaction. The Bondora platform is changing fast and the indentification process get’s even more complicated. I fear that I won’t get my remaining funds back. I would not invest with Bondora again. There are no “Lithuatian” loans on Bondora. Did you mean Estonian. Hopefully your identification problems were resolved?